turnovers—of the apple variety—than walkovers, but my little girl is in the midst of full-on gymnastics adoration. Here’s a clip of her on the uneven bars. Okay fine, that’s Olga Korbut at the 1972 Olympics. But with practise Avery will get there. Minus that ‘Korbut Flip‘ on account of it being all holycrapcanyouevenbelievehowcraythatmoveis?! This gymnastics centre serves all children, treating each equally, fairly and funly. Okay, funly isn’t a word but it should be. Just look at the smile on Avery’s face with coaches Andrea and Fiona. Pure. Happy. 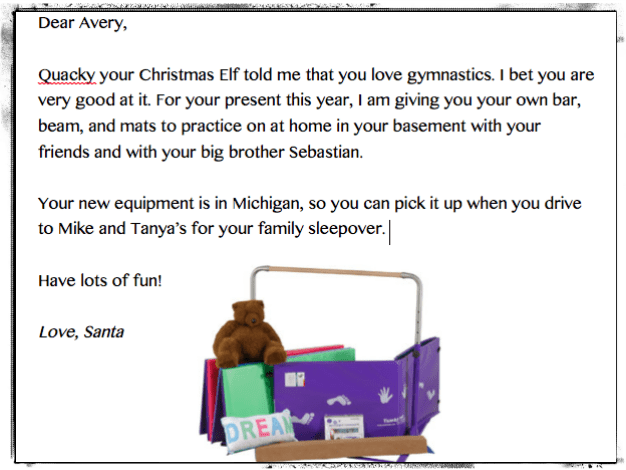 So with some gymnastics fundamentals under her belt and a love of the sport deeply embedded in her leo clad soul, Santa Clause decided to give Avery more of what she loved. With some internet sleuthing I came across Tumbl Trak—this company makes quality equipment for gyms across the globe. If you see a thick blue mat or a sturdy balance beam at your child’s gymnastics centre, chances are it came from Tumbl Trak. Not only do they make gym grade equipment, they also have pieces that are perfectly sized and suited for home use. 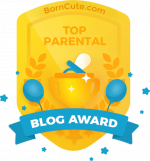 Check out this short clip to see what I’m talking about (it features Jordyn Wieber so if you have a gymnastics loving kid, she’ll most likely squee). You can buy the pieces you want separately, or do what we did and buy a “Begin With The Basics” package. It’s not cheap, but since we were prepared to spend nearly the same amount for a gaming system for our son, and we knew how much time/enjoyment/skills practise/gross motor development/exercise our child would get from it, the cost was justified. The shipping fee to Canada is quite pricey so we decided to drive to the warehouse to pick it up and saved a bundle that way. The Tumbl Trak warehouse is located in Michigan about a 4 hour drive from Toronto. We spend a week with family in Michigan every year anyway, so it made sense for us to pick it up directly. FYI—if you make the trip, there’s a casino and a Great Wolf Lodge style hotel within minutes of the warehouse. Hello, fun family vacation. so instead Avery found this promissory note in her stocking. Our basement has now become a mini-Schlegel’s. Minus the amazing coaches. And fun bouncy floor. Avery loves having friends over to “hang.” What’s with little girls and hanging upside down anyway? I need to make a plaque to display above the Kip Bar that says, “You can’t frown if you’re upside down.” Am I right? One final note: Avery is not yet allowed to use the equipment without an adult present. When not in use (aka when I’m upstairs and don’t feel like supervising), we set the Kip Bar to its highest setting so Avery can’t flip over it on her own. I know, meanies. But, it’s safety first and all of that bubble wrapped goodness over here. 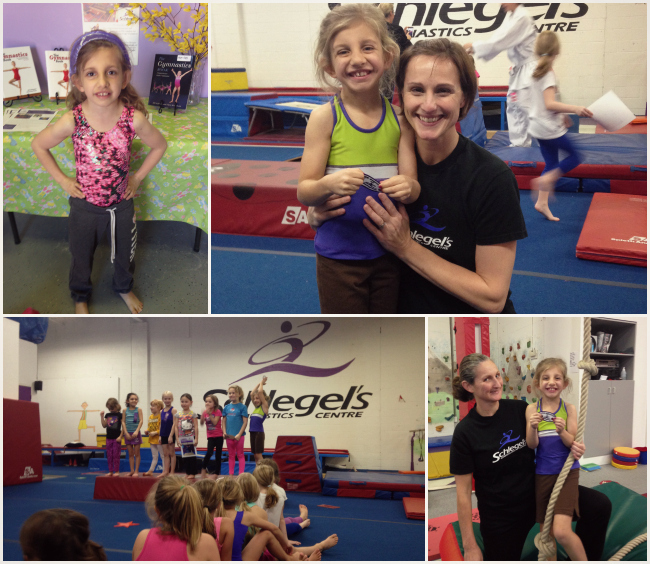 If you have a gymnast in the making, consider setting up your own mini Schlelgel’s at home. 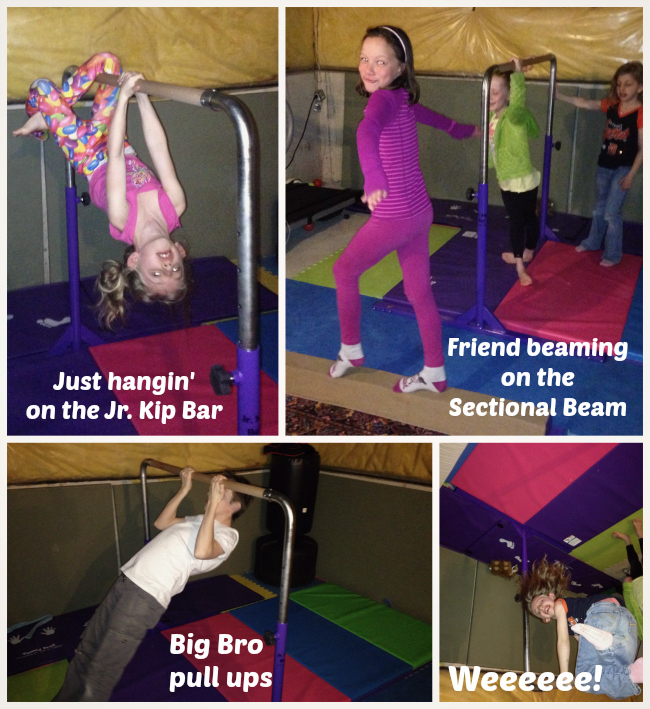 Now that the weather is nice, we’re going to bring the mats and bar and beam outside for some backyard gymnastics fun. Cartwheels and handstands on the lawn? It’s like 1979 for me all over again….